A small group of MPs look set to announce their resignations from Labour, senior party sources have said. At least four backbenchers who disagree with the Labour leadership over its handling of Brexit and anti-Semitism are thought likely to break away. They are announcing the formation of a new group in Parliament - the Independent Group. Labour's deputy leader Tom Watson urged those thinking of quitting to "stay and fight their corner". "That is what political parties are," he told BBC Hereford and Worcester. "They are democratic spaces for people to win arguments." He said he had been "hearing rumours of a splinter for about a year now". Anger over the leadership's refusal to get behind calls for another EU referendum, combined with dismay at its handling of anti-Semitism allegations, have led so-called "moderate" MPs already disillusioned with Mr Corbyn's leadership, to consider their future. An event mid-morning concerning the future of British politics can mean only one thing - that after months of mounting worry and concern, some of Labour's backbenchers have made the major decision to leave their party. This doesn't necessarily mean they are about to unveil a new party, and it doesn't necessarily mean that the group will be able to sway much power. This morning's event may see only four or five MPs announce their decision. But it seems that the divisions in the Labour Party could not be contained. 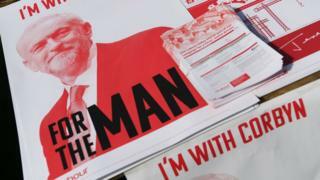 Many of Jeremy Corbyn's MPs have long been convinced that the party should be much more enthusiastically campaigning for another referendum on staying in the EU. But those leaving later also have broader fears about the nature of his leadership and the pace at which Labour has dealt with anti-Semitism. The group set to depart may be small, but they are not the only ones inside the Labour Party who hold major concerns. Last week, former shadow chancellor Chris Leslie said it was "heartbreaking" that Labour was not united in arguing against leaving the EU, adding: "I certainly think we are being played for fools by the leadership of the Labour Party." Chris Leslie, Owen Smith, Chuka Umunna and other Labour supporters of the People's Vote campaign for another EU referendum have been linked with rumours of a split for some time - Mr Smith told the BBC last week that he was considering his future in the party. A row over the treatment of Liverpool Wavertree MP Luciana Berger - an outspoken critic of Mr Corbyn's handling of anti-Semitism and Brexit, who had been threatened with a no confidence vote by local party activists - has sparked a fresh round of in-fighting at the top of the party. Tom Watson said he wanted "all members of the Labour Party feel welcome in our democratic structures" and he claimed there had been "bullying" by some activists in Liverpool Wavertree - something that has been denied by the branch's leadership. 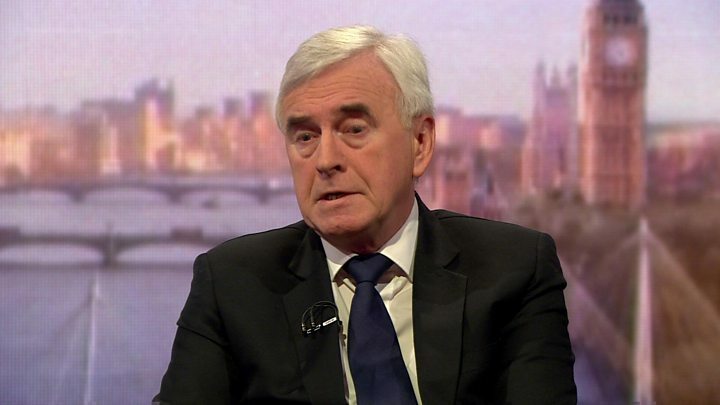 Shadow chancellor John McDonnell said on Sunday he did not see "any need for anybody to split from the party". "Those saying we'll split if we don't get a 'People's Vote' [another referendum on the final Brexit deal] - well, we've still kept that option on the table and it might come about," he added. Mr McDonnell insisted the party was "holding together on Brexit" and would be "ruthless" on claims of anti-Semitism that have plagued Labour. He said the effect of MPs splintering from the party would be similar to the SDP breakaway in 1981, which split Labour's vote and "installed Mrs Thatcher in power for a decade". Manuel Cortes, general secretary of the TSSA union, a supporter of Jeremy Corbyn's leadership, urged Labour MPs to stick with the party. "I'd urge anyone in our party thinking of bolting not to do so," he said. "Brexit or any other issue isn't an excuse for breaking away. Labour is the only show in town for creating a fairer Britain. Our voters need our MPs to be made of sterner stuff." Mr Cortes, whose union backs another referendum, added: "We must get behind Jeremy who is leading the fight against no-deal. "I also don't anticipate he will rule out a final say as this is our party's policy and he's no dictator." Stephen Kinnock, Labour MP for Aberavon, told those thinking of quitting: "We have a duty to deliver for people that we are elected to represent and to change the country for the good and the Labour Party is the vehicle to do that." Asked on BBC Radio 4's the Westminster Hour what his message for those who wanted to leave the party would be, he said: "I would say to them that there are certain people in the party with whom they disagree very strongly. "The way to win the battle, if you like, is to stay in and fight." A former Labour vice-chairman said on Sunday he would quit the party over what he saw as a repeated failure to tackle hostility towards Jewish people. Former Barnsley East MP Michael Dugher, who stood down at the last election, told the Sun: "I can no longer justify paying subs to a party which I now regard as institutionally anti-Semitic." On Sunday, Labour members on social media began circulating a graphic pledging to work towards a Labour-led government "under whatever leadership members elect". Brexit: Could Labour rebels form new party?